Stefan Bienz ~ Bass, Allan Crossley ~ Piano, Scott Gamble ~ Drums - Check out the audio links and 'liner notes' below. OR Download from CD BABY. Also on Google Play and other music services such as Spotify. 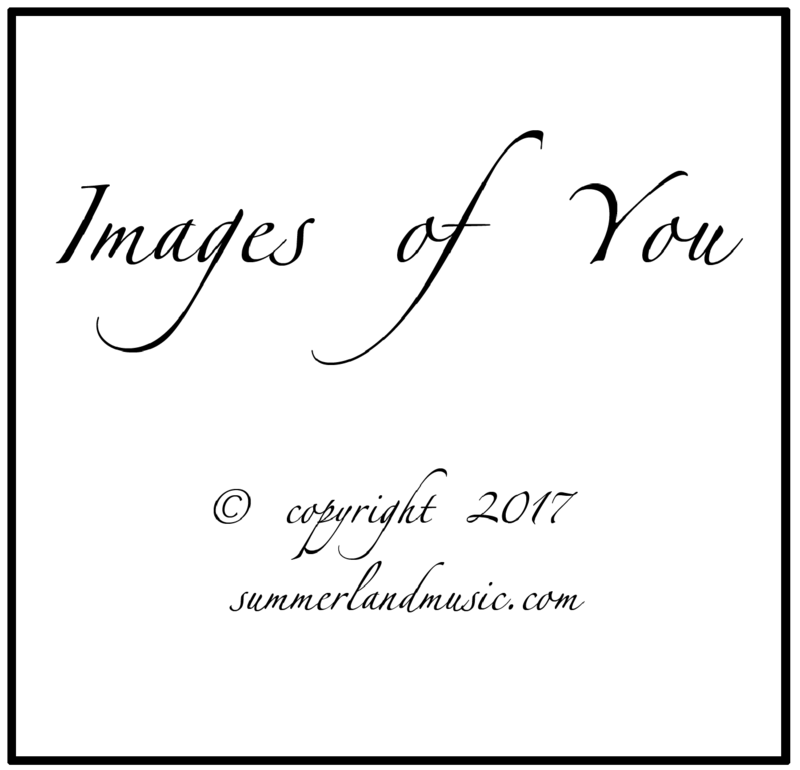 Search for "Images of You" or Allan Crossley. I miss vinyl records — not for all the pops, clicks, and scratches, not to mention flipping the record over every 22 minutes, but for the liner notes. (And for those of you who still think vinyl is superior, let’s just not go there.) I fondly remember the feeling of putting on a disc, pulling out the carbon fibre record cleaning brush to remove the dust and static, and then sitting back on the couch and unfolding that double album cover and getting at those details. What follows is my attempt to satisfy those of you who have that same craving. So sit back with that tablet/laptop/phone and read on. When Dad left in military in 1945 and headed off to that dance in Lethbridge, little did he imagine he’d meet . . . no, too far back. I met Larry Crawford when I started teaching band in Summerland in 1980. He’d often drop by the band room at 7:30 A.M., horn in hand, and help out with the jazz band, or meet me on one of my prep periods to sight read Teleman flute duets. His support, advice, and humour were such an encouragement. Fast forward about 20 years; I’d taught jazz, loved it, but had never played more than a smattering. One Sunday morning I got a phone call from Larry. “Allan, we’ve got a gig at the Grist Mill. I’ll pick you up in an hour. We can choose tunes on the way.” I still get embarrassed thinking of how badly I played and how he reminded me to not play all those notes when he was soloing, but I was ‘bit by the bug’ and have been chipping away at my jazz chops ever since. Fast forward again to 2015. I’d been playing solo piano at Zias restaurant in Summerland since retiring and thought it would be fun to put a jazz night together and Shannon agreed that I could try. Stefan and Larry were my obvious choices, but I wanted a vocalist to round things out. Stefan suggested Yanti and we were off, doing Jazz@Zias a number of times over the next two years. During those nights, I always programmed one or two of Larry’s amazing original tunes, and then during our show in Jan of 2017, it occurred to me that it might be fun to write lyrics for one of them, “Mi Niña Melancholica.” Larry said, “Lots of people have threatened to write lyrics, but no-one ever has.” (May not be an exact quote.) In any event, he gave his blessing and the seven vocal tunes on this album are the first Crawford-Crossley collaborations — and hopefully not the last. And since Larry has literally hundreds of tunes, I could be busy for some time to come. The songs were recorded at my house in March-May 2017. Ideally, we’d have gone on the road and performed a bunch and then done a live recording in a good studio with an engineer. But that was not to be for this time around. Due to the limitations of the space, we recorded Yanti’s vocals and then Larry and Stefan and I added the backing tracks, with Scott joining in at the end. Would love to do a live recording someday with a real engineer, but for now, I hope you enjoy what we’ve created. I never tire of hearing Larry’s playing. He seems to have an endless supply of melodies that are a delight to the ears. And the ease with which he switches back and forth between flutes, clarinet, and sax, is mind boggling. I know I can’t do justice to his history, but he’s ‘been there done that.’ He’s toured and soloed in some great bands, backed some big name stars, and done a heap of recording. I’m always amazed when one of his stories pops up, “I was out with the accordion player from Lawrence Welk and we went . . .” Larry grew up in Summerland, and after retiring from the armed forces in the late 70’s returned home. And we’re so glad he did. (Her name keeps being corrected to ‘Anti’ by my spell checker) has brought these songs to life. It’s been a delight to hear my words come out of her mouth — transformed from flat ink to magical moments, full of emotion. Her enthusiasm for life and singing is contagious! Is a bass player in demand. I’m not sure if he even knows how many groups he plays with. Besides being nice, humble, and having a great sense of humour, (Images of You? Great title for the album, we could take pictures of sheep for the cover.”), he’s so much fun to work with. The foundation he provides to the sound is always spot on and I listen to his solos over and over again. Little known fact: when I met Stefan, he had a broken tuning peg on his bass and carried a pair of vice grips around to tune with. One day I ground down the broken end into a square shape and glued a drum key on. Check it out, I think it’s still there — and of course, it’s why he keeps such good time. Scott and I have a long history. I met him first when I started teaching band at Summerland Secondary, I think he was in grade ten. I would put challenging charts out (i.e. Maynard Ferguson, Nice n’ Juicy), Scott would borrow the record for the weekend and memorize every lick and never need to refer to the music again. He’s a talented and musical drummer and I love his ideas. I think I’ve said most of it above. One thing to add: Compulsive writer. A good day is when I can get up at 5:00 and get in a couple of hours of writing while the house is quiet. Armed with Larry’s great tunes, and his titles, I set to work to craft some lyrics. So far, the titles, which he claims he just pulls out of the air, have been the spark. From there it’s about six to ten hours of pushing words around trying to get them to fit. Occasionally I suggest a few note changes to Larry and we make some adjustments, but I’ve tried to stick as close to his original melodies as I can — which were not written with singers in mind! This, of course, often makes Yanti’s job a bit crazy, but she likes a challenge — and successfully pulls off some very interesting vocal lines. Yanti and I seemed to gravitate to this one as the title track. When I first read Larry’s title an image popped into mind — my wife had given me a camera as a wedding present, (38 years ago as I write this.) and the first picture I took was one of her ‘standing by the window, face framed with light.’ Okay, I get a bit weepy when Yanti sings this one. A great blues tune. I’ve never experienced hard times, so what business do I have writing about them? Well, I had the title, so felt I should go with it. But I do know, in the little speed bumps in my life that friends and music are essentials I wouldn’t want to be without. The seed for this song was more autobiographical material. The first time I proposed, and was turned down, I responded, “You’re wrong.” Yep, I actually said that. Tracy claims I said, “You’re making a mistake.” Either way, telling that story usually results in a sharp intake of breath and shaking of heads from guys. “What was he thinking?” Ignoring the possibility, that perhaps, he wasn’t. Larry’s original title was in Spanish — courtesy of one of those internet translators. His footnote said, “A chipmunk or small squirrel.” Some consulting with a native Spanish speaker yielded Una Ardilla Listada Pequeña, but then another Spanish speaker contradicted that — maybe it was my bad pronunciation. Chipmunk seemed a safer bet. A fun musical feature of this tune is that the melody actually starts on bar two, which sounds like bar one, for those of you who care about such things. It’s a fun tune to play and the only instrumental on the CD. Originally the title was Moseyin’, but Driftin’ had one less syllable and seemed to flow more smoothly. Autobiographical? Of course. I was leaving a piano lesson in Vancouver, headed back to UBC. Normally I would have turned left, but on a whim, turned right and a couple of blocks later, there she was, waiting at a bus stop. I gave her a lift back to her place. I had thought that she was out of my life, but that chance meeting made me realize how very much she was NOT — I just needed to convince her. But that’s for another album. True story. I’d never seen that word before, so found this on the good ol’ web. “Saudade (Portuguese: [sɐwˈdadɨ], Brazilian: [sawˈdadi] or [sawˈdadʒi]), is a deep emotional state of nostalgic or profound melancholic longing for an absent something or someone that one loves . . . including a melancholy nostalgia for something that perhaps has not even happened. It often carries an assurance that this thing you feel nostalgic for will never happen again. Author Manuel de Melo describes it as, "a pleasure you suffer, an ailment you enjoy." Larry’s original title was Saudade para Angeline,’ I think, but I dropped Angeline to make it ‘gender non-specific.’ The original form needed an ending, so I asked Larry for a few bars of coda and he came up with something totally unexpected, which was just what I needed to give the lyrics a twist at the end. Hope you like the way it turned out. This is a show tune style, so dust off the top hat and cane and kick up your heels. Nothing autobiographical here, but there was that one time when . . .